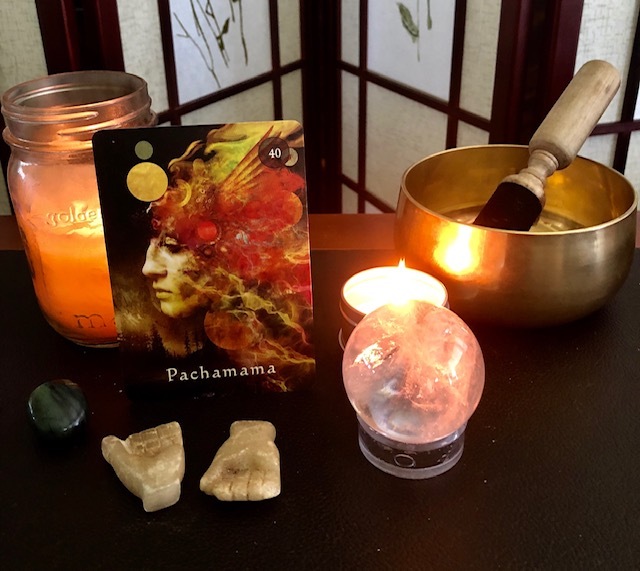 Pachamama, the Great Mother, reminds us of the laws of reciprocity, Ayni, being mindful that we are not taking more than we give. By this practice, communities like the Q’ero in Peru, believe it connects us all to the Great Mother. As we water and nourish a plant or tree, they give us food and oxygen and so much more. Our bodies convert oxygen back to carbon dioxide for use by the tree and plants. We can all do small and great things with love through acts of service, planting, protecting an endangered species, protecting the land and oceans. The Serpentine stone strengthens our connection with Nature and the Earth and its energy gives us ideas on how to contribute to the greater good on this Planet. Giving and Receiving Hands made by the Q’ero community. It’s Taurus Season! Happy Birthday Taurus; It’s Your Time To Shine! 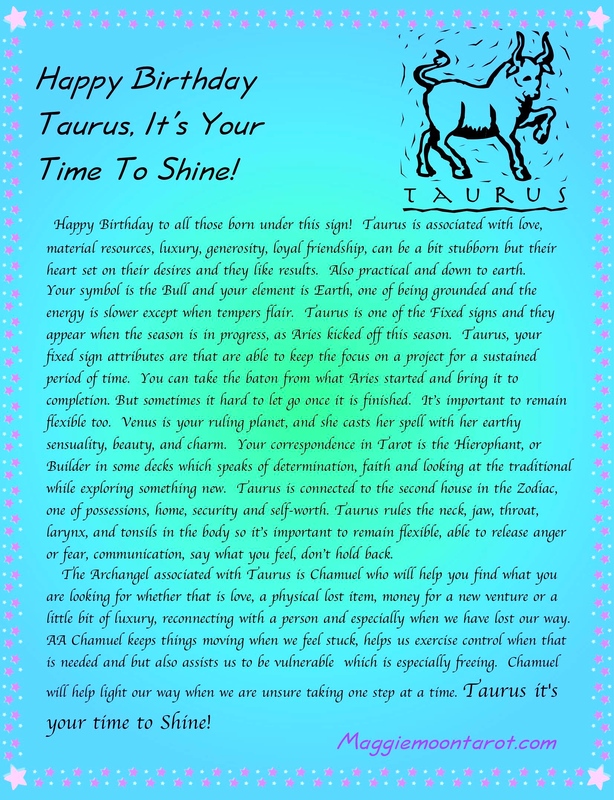 As the Sun moves into Taurus, Happy Birthday Taurus it’s your time to shine! A Taurus friendship is better and luckier than finding one hundred four leaf clovers! Venus is your ruling planet and when you were born, she cast her spell on you with beauty, earthy sensuality and charm! Happy Moon Day! Be nourished under her enchantment. La Luna is full and shinning brightly in the sign of Libra. Venus, the planet of love and beauty is Libra’s ruling planet. Libra talks about relationships and at this Full Moon it’s the relationship we have with ourselves. We often shrink or feel afraid to be seen and take up space. At this Full Moon be free to become full of yourself, feel the Wild, let your beauty spill over to everything around you, shine, and take up space. Brightest Blessings on this Full Moon! 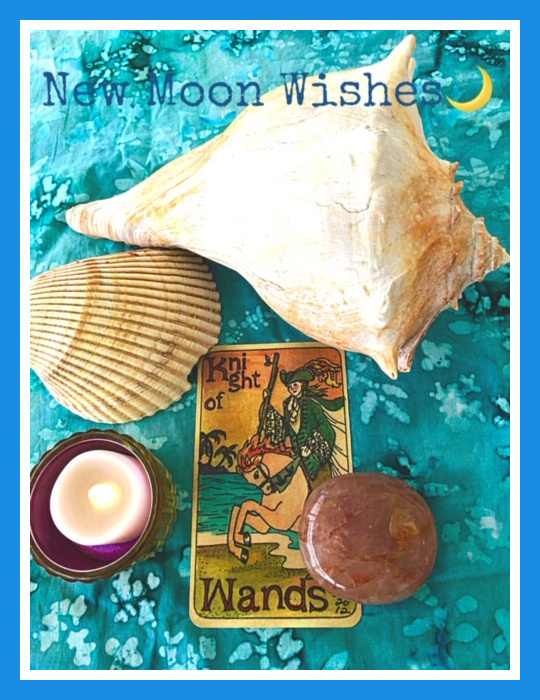 It’s Time to Make Your New Moon Wishes! The New Moon, that magical time for new beginnings and intentions. Aries, the first sign in the Zodiac, starts our Solar New Year and our New Moon brings a burst of energy to ignite our dreams. The element of Fire with Aries gives us confidence to make bold moves; it’s exciting and contagious! 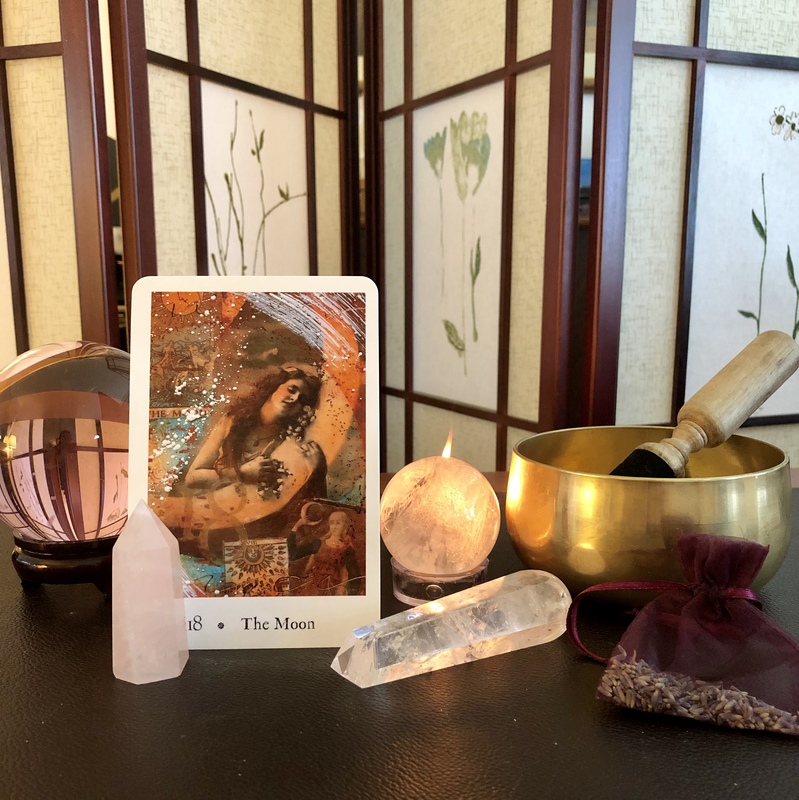 The card that came to mind to match this lunation and cosmic energy is the Knight of Wands from The Mermaid Tarot by Dame Darcy. Being Fire of Fire, he is the purest manifestation of his element. Both the Knight and his Horse embody Aries energy: passionate, creative, ready and able! This Knight offers us his wand and assistance for our New Moon intentions. He may only be here to get us started, as he’s usually off quickly to other grand adventures! 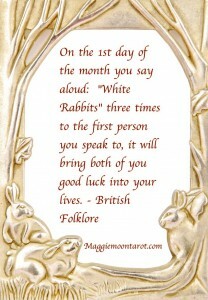 Brightest Blessings on this New Moon! April, the angel of the months, the young love of the year. April is a 7 Universal Month in Numerology for 2019; a time to reset after Mercury has finished his Retrograde. We now find room to breathe. This can be a month to gather our inspiration to clear the decks, whether it’s our food plan, sweeping the cobwebs from our minds and living spaces, creating a welcome space to live and thrive in our physical space and soul. If meditation, gratitude or any of the rituals that being us peace has alluded us, we can begin again. When we begin again with anything, our own Holy Guardian Angel is always nearby. 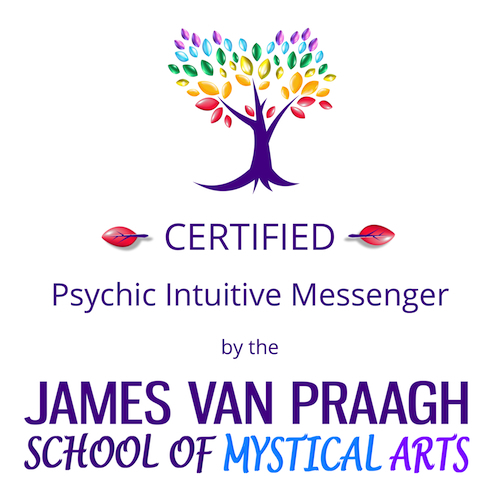 The energy of the 7 is a gift which brings us heighten intuition to guide us. In Tarot, Key Card VII in the Major Arcana is the Chariot. Allow the Chariot to move you forward this month. Remember we are the Charioteer finding inspiration in the liminal places, the quietude, living right where we are; as we are only alive in this moment. May your golden winged chariot take you on fabulous adventures this month! 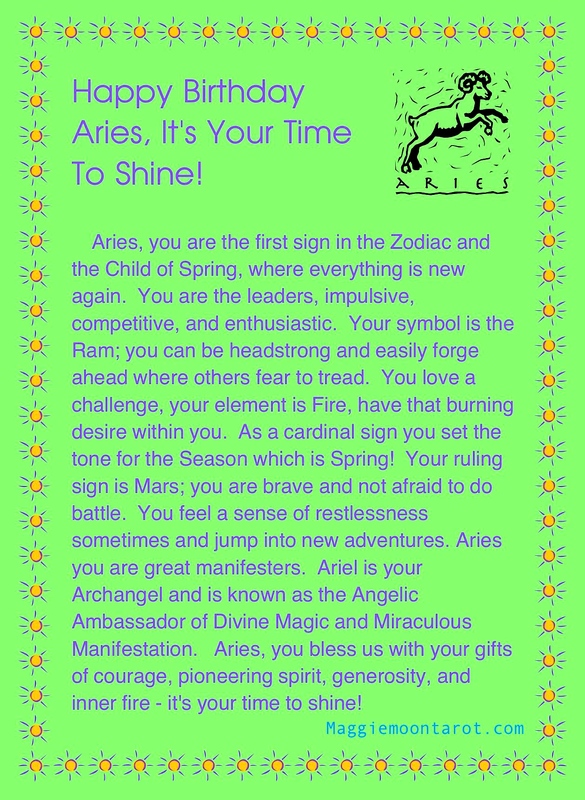 Happy Birthday Aries; It’s Your Time To Shine! The Sun has moved into Aires! Happy Birthday Aries it’s your time to shine. 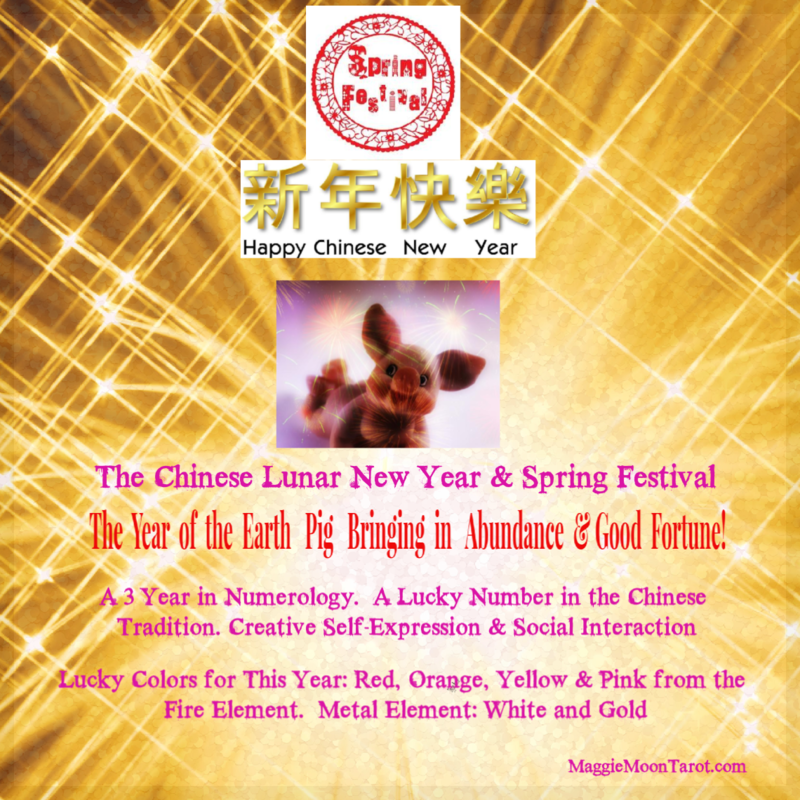 We start a new Astrological year; Aries you are the Child of Spring! It’s Time To Make Our New Moon Wishes! Today we celebrate the Pisces New Moon! It’s Time To Make Our New Moon Wishes! Today we celebrate the Pisces New Moon. This Pisces New Moon asks us to Dream! Hello March! 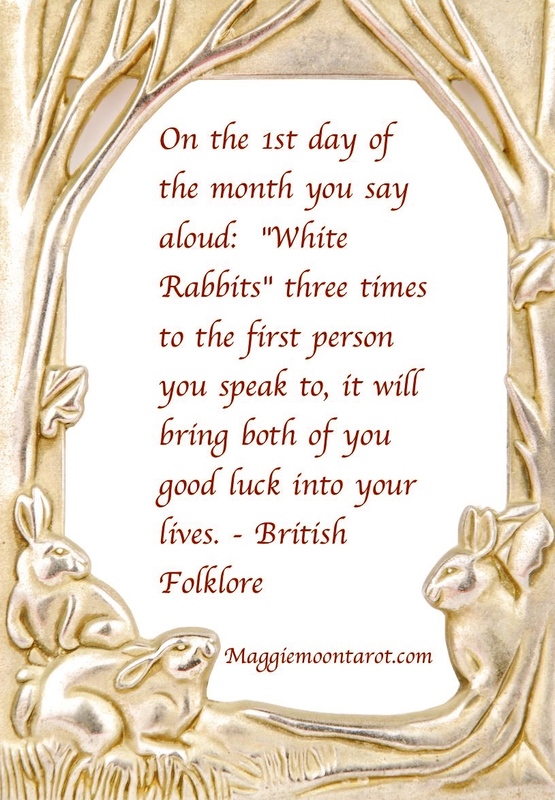 White Rabbits, White Rabbits, White Rabbits, may this month bring good luck to you! 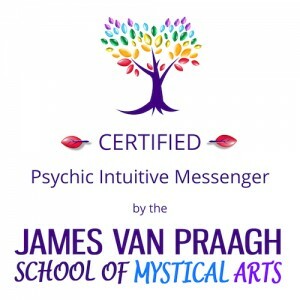 March is a 6 Universal Month in Numerology for 2019; pregnant with possibilities! What’s in the gestation period or ready to birth this month. The 6 is all about nurturing and creativity, home, family and sprucing up our nest! It also can be a great business month. And with our 3 World Year, we make it fun! The 6 and 3 are the Lovers and Empress in Tarot. What do you choose to create and breathe life into. May our hearts be open for discovery on our walkabout this month! 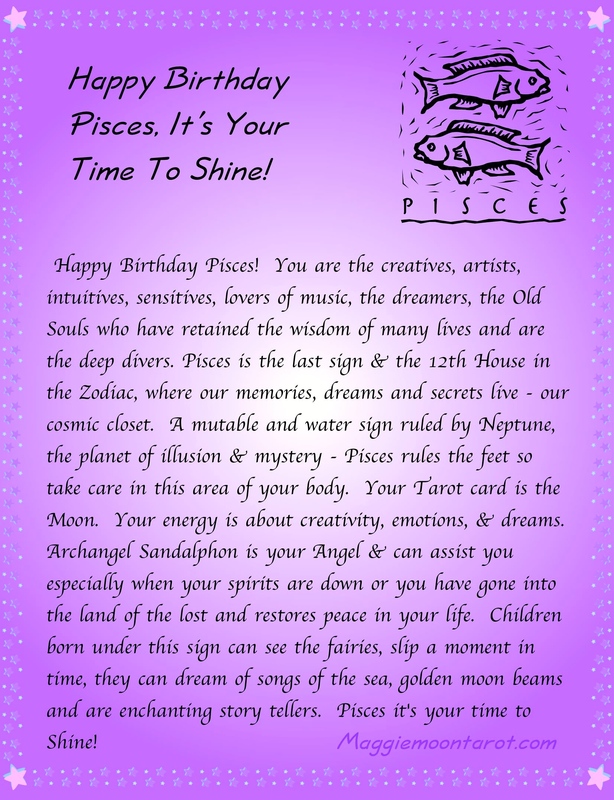 Happy Birthday Pisces, It’s Time To Shine Your Light On Us! Happy Birthday Pisces, it’s time to shine your light on us! Pisces asks us to slip a moment in time to see the Fairies, dream of songs of the sea, Mermaids, golden moonbeams, tell enchanting stories. Wishing you well-being, abundance and much happiness throughout the year!